I think sugar cookies are a very personal thing. I won’t claim to have the best recipe for everyone, but this is, hands down, the best recipe I’ve ever found for my family. Some people really like those crisp, paper-thin sugar cookies. I am not one of them. I like a nice thick, buttery, tender cookie with a crispy outer crust. This recipe is actually one used for cookie bouquets so the dough is nice and sturdy. For the icing, when I’m decorating with my kids I do not want something where we have to pipe on a border and then flood it with runnier icing. That looks great, but it’s too complicated. I discovered this paint-on icing at a cooking class, and it’s the easiest and most beautiful alternative. It dries smooth and shiny. 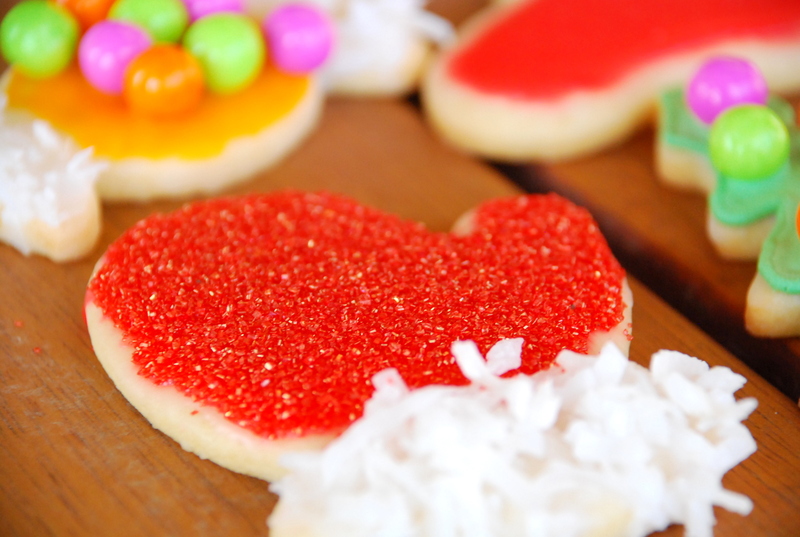 Tip: Refrigerating the dough just before baking is key to the cookie holding its shape and not spreading. Don’t skip it! Sift together the flour and baking powder. In a separate mixing bowl, beat the butter and sugar until light and fluffy. Add the egg, salt and both extracts and mix until combined. Form the dough into a disc and wrap in plastic wrap. Refrigerate for at least 1 hour, up to overnight. Pinch off half the dough and keep the rest chilled and covered while you work with the first half. Roll the dough onto a lightly floured surface to approximately 1/4-inch thick. Cut the cookies into shapes, re-rolling dough once to use scraps, and place the cut cookie shape on a parchment or silpat-lined cookie sheet. Place the whole cookie sheet back in the fridge (or on your porch/garage if it's cold) for 30 min. (This will ensure the cookies don't spread when you bake them.) Repeat with other half of dough. Bake the cookies for approximately 8-10 minutes or just until the edges begin to turn golden brown. Remove cookies from the oven and allow to cool on a wire rack for 5 minutes. Combine powdered sugar, milk, corn syrup and extract. Add food coloring as desired. Repeat in as many colors as you like. If icing thickens over time, add more corn syrup. 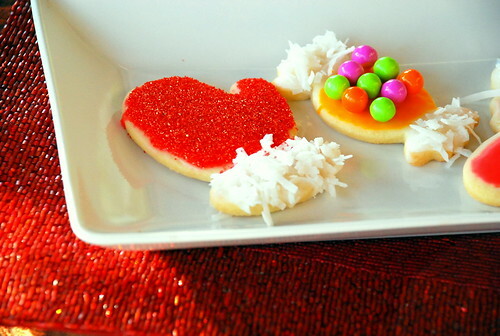 Use a small, clean paint brush to paint on cooled cookies. Add sprinkles or other decorative items.